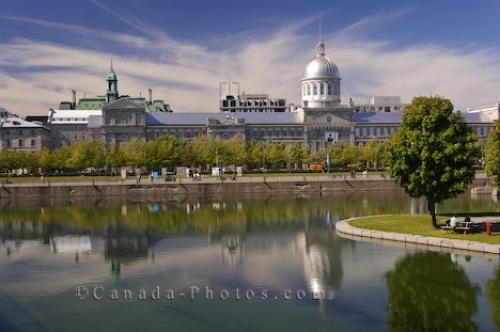 As thin clouds linger above the Bonsecours Market in Montreal, Quebec in this picture, the sun breaks through to show the reflections in the water. In this picture you can see the how long the building that houses the Bonsecours Market is in Montreal, Quebec and the beautiful mirror images created in the Bonsecours Basin. As people stroll around the park like setting that surrounds the Bonsecours Basin, others are busily shopping in the market. Bonsecours Market, Marche Bonsecours seen from the Bonsecours Basin, Old Montreal, Montreal city, Quebec, Canada. Picture of the Bonsecours Market and the park like setting around the Bonsecours Basin in Montreal, Quebec in Canada.